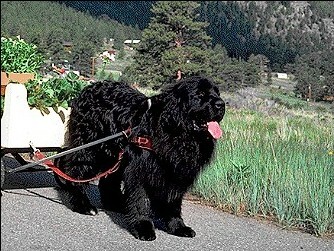 DNA tests are now available for the full range of colors and markings in Newfoundlands. In Canada, brown Newfoundlands are not shown but they are in other countries such as the U.S. A DNA test is available to determine black dogs that carry brown. In a few countries some Newfoundland dogs are grey. A DNA test to distinguish dogs that carry the common grey allele is also available Newfoundland dogs are either solid colored or have white spots. The spotted dogs are called Landseer, when they are black and white, after the painter who so often painted this type of Newfoundland. In several countries the only dogs with white spotting that can be shown are the black and white dogs. Dogs with white spots always have two sp alleles. Although some dogs which are S/sp heterozygotes have white toes, not all such dogs have this. A small white chest spot is no indication of an sp allele. It occurs in many breeds. * subject to HST for Canadian residents only.